We met at Fuller Seminary, sharing a common interest in Japan and missions. We were married in 1997 and continued moving forward toward our goal of serving overseas. Eric finished his Master of Divinity at Fuller, and then taught for two years at a charter school for troubled teens in southern California. Sue continued working on her degree, and served in Asian Access' U.S. office in staff development and human resources. Sue is from New Jersey and previously spent 3 years in Japan prior to getting married. 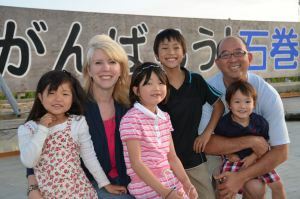 Eric is from Hawaii and has done ministry in Brazil with a Japanese congregation. Our children Owen, Annie, and Olivia, as well as our little Maltese Molly, have helped us in great ways to build relationships! Before moving to Ishinomaki, we worked in Sanda, Japan. (Sanda is about 40 minutes from Osaka and Kobe). 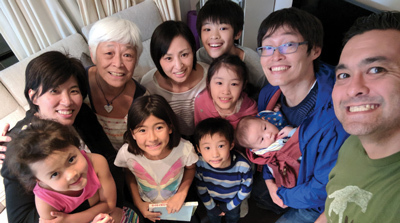 We served as Area Leaders in the Kansai Church Planting Network. Prior to moving to Sanda in July 2004, we spent two years in Sendai, Japan at Sendai L'Abri Bible Church. Eric learned a lot about the church's outreach to children, and both of us learned about discipleship in Japan through a great program at our church there. Pray expectantly, knowing that God delights in making our paths clear. He will not (usually) unfold the whole plan, but will always give you enough light to make the next step. Go to an outside hotspring! We love to be creative in doing ministry. We’ve used our hobbies (old ones and new ones!) 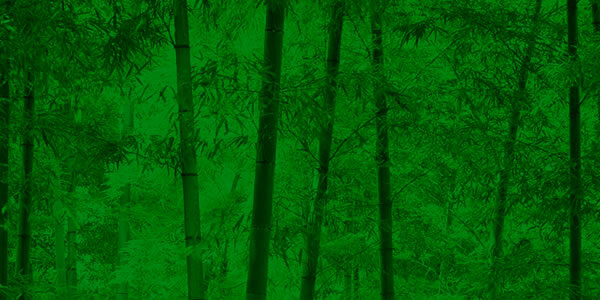 to build relationships – bonsai, cloth-dying, even practical jokes! It's great that God takes who we are and wants to use us to do His work. I (Sue) was at a farewell party in a church in Japan after I had spent a summer there. I was giving a farewell speech, being translated for the church by a proficient translator. The pastor and his wife had a darling 5 year old son (I was single at the time). I said in English, "I don't care how many years I have to wait, it's worth it to me if I can marry the Satos' son." The translator translated. The pastor, his wife, and the congregation, were silent, and slowly turning green. So I repeated the sentence. The translator translated it again, hesitantly, looking at me to clarify. That time I caught what he said in Japanese: "I don't care how many years I have to wait, it's worth it to me if I can marry Sato - san." (San is the Japanese word for "Mr"). Needless to say, we all turned red, and laughed a lot after that! We love loving the Japanese people. There's no greater joy to us. They are warm, and open, and often difficult to understand -- but the blessings are way beyond any others that we know. 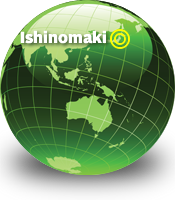 Why did we move to Ishinomaki? 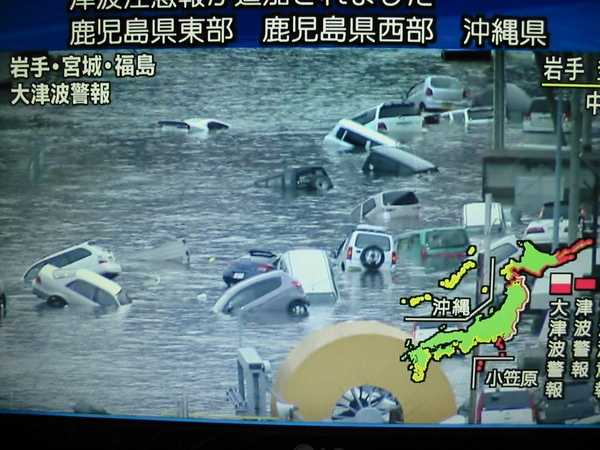 Tomorrow we will commemorate the fourth anniversary of the triple disaster. It is a very somber time for the community and for the nation. Please pray with us. Pray that we can listen well; that we can walk with people well through this time. We will be praying for 24 hours through the fourth anniversary and your prayers are appreciated as well! Nozomi Project started in 2012 as a response to Japan's terrible tsunami in 2011. And through this creative ministry, God is making something beautiful out of something broken. started in 2012 as a response to Japan's terrible tsunami in 2011. And through this creative ministry, God is making something beautiful out of something broken. We were attracted initially with Asian Access' "cutting edge" ministries -- seeking to be relevant in a very up-to-date culture, while always seeking to clearly communicate the wonderful message of the Gospel. We love the emphasis on people development -- much less concerned with numbers than with providing the right tools for where people are. The past 5 years we've seen great growth in this area, and pray that we continue to listen to God and move forward in this direction. Finally, we love the people with Asian Access. They're fun; they have a passion for God and for the Japanese people and for ministry; they are all unique and wonderful.